For the latest news about developing for Google+, please read the Google Developers blog. We’ll post all new announcements about the Google+ API, buttons, and developer tools to the Google Developers blog instead of this one. As always, you can find documentation for the Google+ platform and getting started guides at https://developers.google.com/+/. Thanks and happy coding. UPDATE (1/9/14): These updates were launched on Android as part of Google Play Services 4.1 (learn more). 1) Better auto-complete. Now when users start adding recipients, auto-complete will suggest Gmail contacts, device contacts, and people on Google+. And of course: users can also just type in an email address. Auto-complete now suggests Gmail contacts, device contacts, or anyone with a Google+ profile. 2) Suggested recipients. Users often share with certain people more than others (like family, for example), so the new “Suggestions” experience highlights these frequent and/or recent contacts at the top of the sharebox. Adding a recipient is as easy as tapping their photo. Check out our developer documentation to learn more. 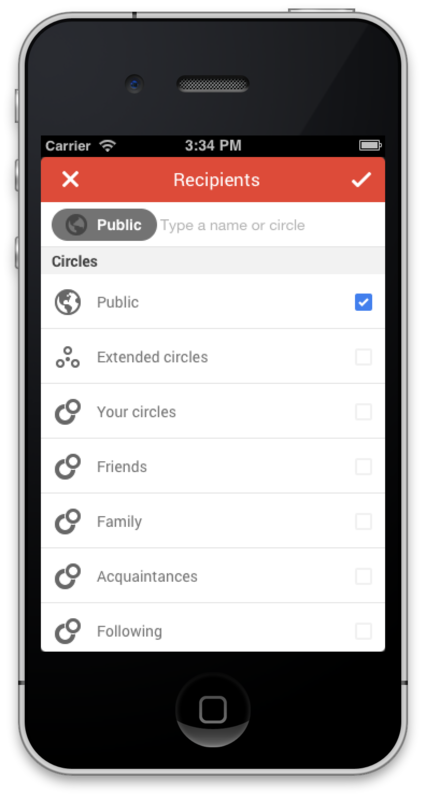 If you’ve already added the Google+ sharebox to your iOS app, just upgrade to the latest iOS SDK to use today’s features. Ayush has shared an article on Mashable with me. When I click the “View” button in the interactive post, I’m taken to the article page on Mashable. Mashable encourages meaningful on-site interaction by displaying who shared the article with me, and inviting me to discuss the article with that person. Having context and a targeted action button entices users to respond back and keep the conversation going. When I’m taken to Mashable, they include sharing context and encourage me to respond back. When I click the “Discuss with Ayush Agarwal” button, the Google+ sharebox includes a pre-filled message to Ayush ("Thanks for sharing, +Ayush Agarwal"), and it adds him as a recipient in the “To” line. I can then extend the conversation by adding additional text and sharing with more people from my circles or with specific email addresses. Mashable pre-fills Ayush as a recipient in the “To” line and pre-fills some text in the sharebox. Mashable’s unique way at providing social attribution for those who share content furthers the conversation in an authentic and meaningful way. By working interactive posts into your user flow in a relevant way and by making it easier to share, you can keep users engaged in your content longer. To get started and for more info on interactive posts, visit https://developers.google.com/+/features/interactive-posts. If you’re using OpenID v2 or OAuth 2.0 Login for authentication and want to upgrade to Google+ Sign-In, we’ve made it easy to do so; it’s entirely your choice. Google+ Sign-In can grow your audience in multiple ways — including over-the-air installs, interactive posts, and cross-device sign-on — and now it’s fully compatible with the OpenID Connect standard. For more details, see our sign-in migration guide. This is the first in a 2-part series that chronicles best practices for interactive posts. Come back next Monday to read the 2nd installment. When I create a group gift on Fancy, there’s a prompt to ask friends for contributions. Prominent placement of the button on the page encourages users not to miss it. When I send the post to friends they’ll see the “Contribute” button in the post, taking them back to Fancy to add funds. Fancy has also integrated Google Wallet so users can pay with just one click. Fancy designed their site to help users involve friends in meaningful ways. The action they want users to take is included as descriptive text on the share button, and it’s relevant to what users are doing on the site. This produces a clear and compelling case for involving friends. By giving users meaningful context why they should involve friends in your app and prominently displaying the call-to-action, you can create highly targeted, action-oriented shares. gapi.auth.signOut() signs the current user out of your app. A new status field indicates whether users are signed in to Google and/or your website, and a new method field describes how the sign-in occurred. You can now specify sign-in parameters once in <meta> tags, versus passing them multiple times to multiple page elements. These page-level configuration parameters simplify your integration of Google+ Sign-In and interactive posts. The sign-in callback is now dynamic when using page-level configuration. This makes it possible, for example, to sync your site’s user experience across multiple tabs. We hope these changes make it easier to integrate your website with Google+ Sign-In, and we welcome your feedback in the Developing with Google+ community. 2. ID token support. ID tokens allow you to securely verify the identity of users of your iOS clients to your application servers. Companies like Huffington Post are already taking advantage of these new features. 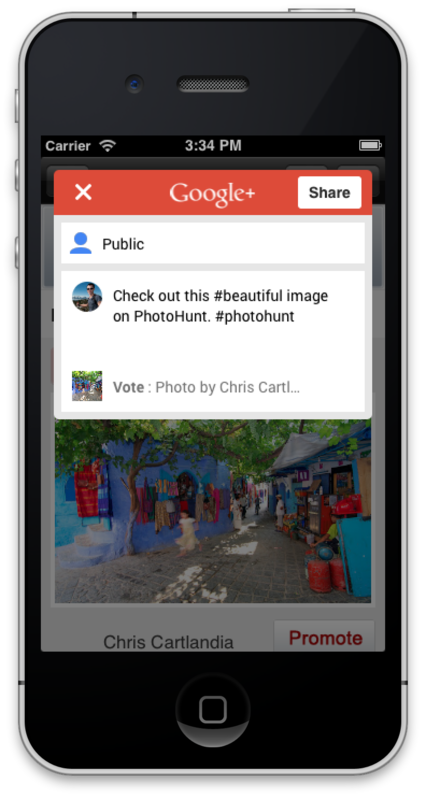 To download or to learn more about the Google+ iOS SDK, visit our Google+ Developers site.